I think often about that woman in the Bible, the intimidating woman hanging out in Proverbs 31, the model of a perfect woman. She wears all the hats. She does all the things. In my Grandmother’s day, no woman was ever asked what she did for a living. A woman’s job was her home; where she cooked, cleaned, and raised a family. The majority of them were very content making a house into a home because they knew they were right where they were suppose to be. There is a great mystery in finding contentment, even in the hard stuff, because one is solidly convinced it is where he needs to be. I’m right there with ya! Thank you for posting things in a way that don’t just make a person feel like they are “not alone”, but feel encouraged to change those things. I find it is completely impossible to feel alone online because there is always someone with a same weakness or sin; it is far too easy to use that as an excuse to not move forward. Wallowing in weakness is not embracing sanctification! And that is seriously scary for me, because if I am not humbling myself correctly then God will humble me and that usually is much more painful. “Wallowing in weakness is not embracing sanctification!” Amen, sister. Thank you for saying that. Amber, I love what you said about “wallowing in weakness!” I need to write that one down and post it where I can read it! Thank you!! Amber…just echoing other ladies here – great comment. Convicting too. Thank you. Well said, Kelly. Thank you for sharing from your heart! I listened to a podcast by Kara Murphy earlier this week on the same topic. The Lord’s best for us is rarely found online (or any screen, for that matter), it tends to be right before our eyes if only we would open them to see. We are setting the example for our own children — they are not blind to where our treasure lies. Ouch. Oh my heart hurts. Thank you for writing this timely post. Lisa: where can I find the podcast by Kara Murphy?I want to hear more. Thanks! Another great comment and ouch! I’ve had to tell my girls many times how much I regret the time I wasted – even before when the internet was still new and “social media” was not even on the radar. Even more your statement “The Lord’s best for us is rarely found online (or any screen, for that matter)… Thank you! Yes! Yes! YES!! Saying what needs to be said again, Kelly! Kudos sister. You know, I see young moms blogging their heart out and their blogs far surpass my own (not that I’m really trying in that area), and I wonder at what cost? Do they use children’s nap time to be online, but the rest of the hours are dedicated to family and home? The internet was new when my oldest were babies and there wasn’t much to do online, so I would spend time praying when my babies were napping. How many prayers go un-prayed because we get online instead? Will these young moms regret this in 20 years? I admit to nursing a baby more than once while staring at a screen and clicking the mouse simultaneously. Looking back, I would have rather been looking into that sweet baby face. Us older moms may regret time spent in front of a screen as well. I agree, it’s a love/hate relationship. Great article Kelly, I praise the LORD for your service to Him! So so true. It is addicting. The young people of today cannot even put their smartphones down long enough to have a conversation. I shudder to think what their kids will be like. I saw a quote by John Piper some time ago- One of the greatest uses of Facebook and Twitter will be to prove at the Last Day that prayerlessness was not from lack of time. Talk about convicting! Amen!!! Perfectly said and I couldn’t agree more! People look at me strangely when I tell them I do not have hopes for my daughter to go to college and get saddled with debt and then not be able to be home with her children. I’m not against higher learning ~ at all….but I am against young women being so saddled in debt that they *must* work in order to pay the debt off. This usually happens when their children are young and they have to go to daycare or their grandparent’s house. When I think back to my childhood, I recall warnings about bad things to steer clear of, but I don’t believe anyone ever mentioned that things that were good in and of themselves could cause numerous problems if they were allowed to largely supplant what is excellent in life, and needful to our loved ones, whether we find those things enjoyable or not. Satan masquerades as an angel of light. If we let our guard down while we’re online, he can easily convince us that more is better when it comes to a good thing, which the internet certainly is in many respects. I think this is spiritual warfare — this staying online long after we should have moved on, back into the real world — and it’s so insidious because it’s happening while we’re in our comfort zone. Who wants to fight that battle when we can be smiling and yucking it up throughout the day with friends online? Or even when we’re having serious discussions on important topics, but we are more needed in the real world at that moment, or for that day, or even season of life. We are so short-sighted. And meanwhile, time marches on, the moments melt into days…months…years…and our children grow up and we wonder where the time went. It’s sobering if/when we come face to face with the reality that we missed large swaths of time pursuing the good (or less-than-good) at the expense of the excellent, the people and activities which matter most. As an aside to any of Kelly’s readers who may misinterpret what I mean, please note that I am not saying there’s anything wrong with engaging in humorous or serious discussions or doing any other wholesome thing online. These are good things when done in balance. I am greatly encouraged to see how the Spirit of the Lord is clearly working in His people, as this topic of internet overuse is being discussed more and more now, and is being recognized as the problem it is. Full disclosure: We have a long ways to go yet in our family to tame the techno-beast, but I am grateful to the Lord for how much peace He’s granted us on our media-free days (once a week at present). It is still a challenge, though, to shut down the screens after a reasonable length of time on the days we aren’t media-free. My encouragement for the young moms is to embrace the slow days. Our family’s media-free days seem long — to me, anyway, sometimes — but that’s OK. I don’t remember who said it, but the saying resonates with me: “The days are long, but the years short.” I’m glad for the opportunity to make the most of those fleeting years, spending my days at home with the children He’s graciously given. Look into those little faces (and the bigger ones, too), Mama, and know that you’re doing a work of great magnitude. You inspire me, 6 arrows. I think the fault lies, to be frank, in the idea that life *should* be exciting all the time (when, realistically, there is a lot of boredom and tedium involved in, well, anything). In the idea that, if we are “good at” doing something, then it shouldn’t be difficult. In the idea that, if something is worth doing, it should be pleasant, come naturally, and be accomplished without struggle. Even our heroine, the Proverbs 31 Woman, appears by the text of the Bible to do all these things without struggle. She’s not, by appearances, another hausfrau struggling along. She’s a paragon; if she was written about today, it would be in the pages of glossy magazines. I realize (or remind myself anyway) that she’s NOT that image– that she hauls herself out of bed while it is yet night, puts on crimson and purple one piece at a time, stretches out her hand to the distaff when she’d probably rather be doing something else (and perhaps struggled to learn to spin an even thread), and puts the LAW of kindness on her tongue because it decidedly did not come naturally to her. At the same time I’m reminding myself of that, it’s difficult to remember. Because, after all, from the road over (or the other side of the page, or on Facebook), everyone else is doing it perfectly. Effortlessly. Without failure, and without struggle, and without the need for the encouragement I’m online searching for today. It’s just too hard FOR ME. Because I must be cut out for something else. Or else I’m just not a creature of God. So we think. And we give up, and go look for something easier. Not quitting. Not here, not now, not me, not yet. Not when He provides angels to bear me up and keep me going. Oh wow, this was beautifully poignant, MC. Wow! Just wow. This was written for me. The Internet can so quickly become a destructive tool for homemakers. Thank you for the wonderful post Kelly! I really enjoyed reading it and the all the comments. Oh the internet trap, it is so easy to fall into and never look back. As a young mom, who doesn’t remember motherhood without the internet, I am thankful for women like yourself who are willing to call us out and remind us of our purpose in a kind, yet thoughtful and convicting way. Thank you!! This is exactly why I wrote my book: to give fodder for self-reflection and consideration of our ways in our current day. Who wouldn’t rather surf the net than clean floors? 😉 But there is nothing really new under the sun; even the women of yesteryear learned to be idle, wandering from house to house (1 Tim 5:13). Let’s get you on the podcast to continue the discussion! Yes & ouch & thank you! Truth, plain & simple. This is so true! I find other members of my family being lured by the internet as well. Kids copying my frustrated tone when I interrupt their web activity. They have learned this sin from me! I have just recently stopped wasting time on a certain internet activity that was not necessarily sinful, but had no value except pure entertainment. I noticed it was taking me away from LIFE and I decided I would rather live than mindlessly while away the time. I have found it more difficult to manage my home when distracted by the internet. No multitasking for me, thanks! I have a hard time keeping everyone else on task when my full attention is not able to be focused on them. Thank you for the encouragement to press on and make hard yet obedient (to God) decisions. When I left NZ for the UK, I also left behind my very successful career as a paramedic. I had been asking God what he wanted of me. He quietly, and consistently reminded me I had a job – at home. My colleagues could not understand. As someone with a very strong work ethic, I sometimes find it hard. But, many people save lives. I was just one of them. BUT – ONLY one woman is the wife to my husband and mother to my children. I am amazed how satisfied I can feel just hanging the washing on the line in the sun! Why? Because I am satisfied in the knowledge I am raising my children myself, and I am right where God wants me to be! I also nannied when I was young, and have seen what comes of accessory children – the ones raise by others, not their parents. It saddens me to see so many christian women in the workplace. The excuse of I have to work does not cut it for me either. I have been very poor, but every week I tithed and every single week God blessed me with more. Put your hope in God – He will and does provide. Yes, this is such an important reality. I needed this so much right now thank you! 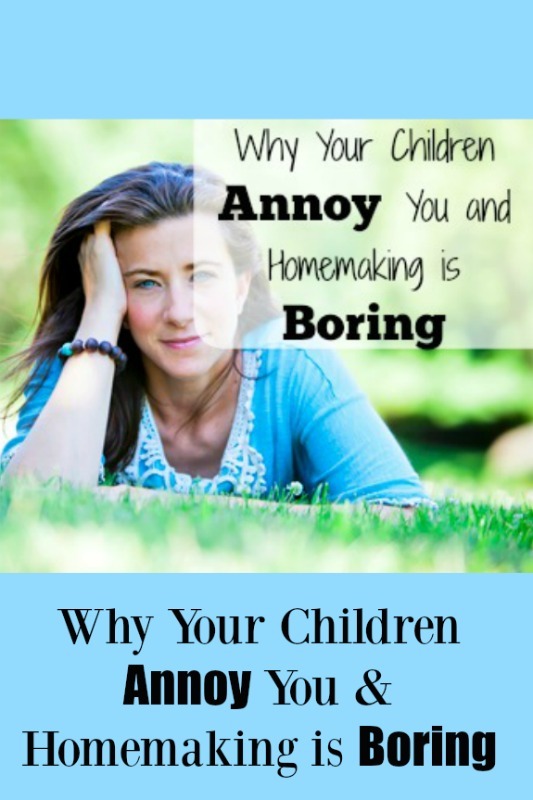 I just started homeschooling this year and I keep thinking maybe it’s to much and feel really guilty that I sometimes feel that my children annoy me. An it is very likely that I feel annoyed because of some of this. Thanks again! Our lives have been turned upside down in the last year which has caused me to reevaluate many things. Life is just too fragile and my God given roles too sacred to fritter my time away on anything less than what He has called me to do. When the thought of making funeral plans for one of your children threatens to become a reality you find yourself looking at things differently. I just don’t want to waste a moment; they’re fleeting and oh so precious. I don’t want to look back and long to repeat the time, time that I should’ve been using wisely. I pray that God will give us wisdom to choose wisely the way we spend our moments and not become distracted so that we trade something that may be good for what we have that is already better. Thank you Kelly for what other commenters have already called a timely post. thanks for your honesty. I am with you as using internet as an escape. I have decided though I will set a timer and when it goes off, I am done til I have moments later to check emails, facebook or what have you. I found out I like reading books and reading out loud to my kids during quiet time. I start needlepoint again and learn to crochet. I am also aware of how I answer my children and learning not too. They are picking up my bad tone and using it on their siblings… So this Easter season I am learning to watch what I say and the way I say it. I make sure I say, “love you” to each child before they go to sleep. I want them to know what I am doing matters and they matter. My kids know I left my dream job seven years ago to pursue being an at home mom and I want them to know my decision was the best I made. yes they know times do get tight on one salary household. But they know I don’t regret my choice. When others ask why I chose to stay home, I tell them what I do is important and it is no more or less than having a job outside the home. Our children are living in a latch key era and I see the way this generation is with attitudes and behavior. My kids have their own issues but being forgotten they are not. They know I am here if they anything like help with homework or just to talk. As I get closer to God I am realizing this is where He wants me to be and I am ok with that, if other aren’t it isn’t my problem, it’s theirs. Yes they are entitled to their own opinion, but it doesn’t mean I have to take it to heart or make it be who I am… I am MOM….. I think it is an untruth that women didn’t think of working before this century My mother worked as a chef.. My Grandmother worked in a rope factory and the other kids would bring the baby to be nursed on breaks.. Women worked in munitions factories and did all kinds of mindless labour in the century before this one.. We have to do what it takes to keep our families running.. I don’t think there should be shame attached either way.. I worked when my older kids were little trying to make ends meet and now I while away the days at home with my late blessing toddler.. It is true I miss working and providing for my family in that way, but I know I missed a lot of my older kids growing up.. Thanks be that my husband earns enough that if we budget carefully I don’t have to go out to work to help pay my families way, but this isn’t the case for all families.. Sometimes moms need to work.. No judgement. It would be easier for these women to do this if there was less judgement and more supports for working women.. It would be great if I could get some childcare supports within my Christian network, though this too is not always possible.. Let’s not compare ourselves to each other. We are all doing the best we can with the gifts god gave us. Great point! Thank you for saying this. Also needed!! I am back here again, re-reading to keep me inspired. Thank you for this post. I have found it so true, and it hasn’t left me. My laptop now goes into its very spunky zip bag for most of the day where I can’t get it out easily with a baby on my hip! Only comes out at certain times for specific purposes, even though I wasn’t spending a lot of time on it anyway. But still more than was beneficial for my home, my family! It really is easier to read blogs or whatever than do actual work! I still enjoy and use the internet, but now it is a very small part of my day, and even the little bit of extra time I have every day as a result; wow, how much I can do with it. And I have more emotional energy for procrastinated upon tasks when I spend less time browsing online – I did not realize how much energy all that input was taking out of me. So thank you! For a profound difference in our home. I hope I may keep growing into it. Thank YOU, for that testimony. I love it! Reading the article and some of the comments may bring up many of our own feelings of being dissatisfied, or misplaced self judgement. Good topic of discussion for women of all ages. Choosing, being determined or blessed enough to stay home with and being able to raise and influence your own children is both an honor and a gift. Working as hard at home to provide as a homemaker is just as important as the job of a husband working and giving everything to make it possible;so we should give it our all everyday just as he does. Both jobs are often thankless and equally rewarding. My children are grown and raising their own children, and I have only one regret for being the wife and mother at home. I did not take time to nurture and recharge myself. We always struggled to make ends meet, drove old cars, no nice vacations, or nice things, but working outside the home to provide more would have meant,” for me”, meant not being the best mom I could be, because of my own expectations of myself. Though I have sometimes thought it may have helped me to be better balanced. The role of the internet and technology can be compared the same way, wonderful and a dangerous black hole of wasted time and energy. I know we have all been there, or it would not strike a chord in us. Thank you for this Kelly! I know this is a struggle that God recently revealed to me. But it is not just the internet, it is where is our focus? If my focus is on God then the daily tasks (however mundane) are more bearable (not always enjoyable, but at least bearable). But if my focus is not on God then I am discontent throughout the day. For me, I need to work on self-discipline. Using my computer for set periods of time and then stopping! The internet is a wonderful tool. But any tool can be abused. This has been very helpful to read and to help clarify my thoughts. Great article! I also use the internet for business. My older children also have online businesses. And you are so right when you say it is a love/hate relationship. It is really neat to read that you have been inspired by a book. I too am being inspired by a book I am reading called, “Set-Apart Woman, God’s Invitation to Sacred Living,” and I appreciate how Leslie brings out how we spend our time online as well as with other fancies like healthy living over a sacrificial sanctified life…idolizing food, even good food over God. It sure is good to meet a fellow mom unafraid to tell the truth. Thank you! You have said it so well! I battle internet usage daily. It’s so much more fun to be entertained than it is to sweep dirty floors and fold the mountains of laundry! Yes! Thank you for saying it! Thank you for helping me see that I am not alone!I pray often for help with this battle! Amen, Gloria. I think distraction, simply, is Satan’s best weapon. Thank you Kelly, for this beautiful and timely piece. I believe God has been dealing with Me in this area. He’s wanting me to enjoy the beauty in Motherhood, and to embrace through the mundane. It can be so difficult, but this serves as a great reminder! I’m sorry when I read websites like this I am dismayed at the lack of understanding of how divergent the roles of women have been throughout society. This post and many of the responses read like something from leave it to beaver. There have always been working women, many women are not able to stay home and just be a wife and mother. Yes I purposely said just a wife and mother. Mothers are needed they are the backbone of soceity, however this non-sense about the home being the “rightful” place for a women is the nice middle-class view of the world. Where is your support for women that have to work? Many women work because they have to help put food on the table. My grandmother raised 7 children, has been married to the same man for over 50 years. My great grandmother also raised 5 and even took on the raising of her grandchildren. Both women worked because they had to, they needed to put food on the table and clothes on the backs of their children. You do a diservice to these women by making it seem that they are less worthy because they work outside of the home. I come from hardworking, god-fearing people that I am proud to emulate. As a young woman I am sad to see how judgemental people from both sides of the mommy wars are. I will not put all of the blame on you all, the feminazis deserve some blame as well. Perhaps instead of judging a woman for waiting to work outside the home or having to work, you should support her. Not everyone wants to stay home or can stay home. Children are at their best when they have a happy parents who feel fulfilled, not stressed out about money or providing basic necessities. For some women that means staying at home with their children, for others it means continuing to work. Personally I think that if women stood together and supported each other more, then perhaps you would see more family-friendly policies. Childen do emulate their parents, I’m glad to come from a family of women that support each other in their individual walk through motherhood. It’s not that I “don’t support women who have to work.” It’s that I refuse to say, “They are equally beneficial to the family.” Research, history and God’s Word tell us that it is indeed, better for women to raise their own children and to be “keepers at home” (Titus 2, “so that the Word of God is not blasphemed.”) at least in the season of life where they are raising children. You are asking me to ignore what we have been commanded to teach in favor of a more palatable/popular opinion. If a society believes that families, husbands and children fare better when mom is at home, then we respond differently to that mom who finds herself forced to work for food–we can support her, help her and change things for her. BUT, when we agree with the feminists that a woman “deserves” to have a career and actually should NOT be at home, it’s that mindset who doesn’t care about the woman put in an impossible position. Practically speaking, I’m certain I’ve read that two income families over the last century has caused the cost of living to be raised. So essentially, we are reaping our own consequences. Things still cost the same (relatively speaking) but now more children are in daycares, women are more stressed and families don’t have a full time manager. If we’re honest, most (not all) families in America aren’t struggling to put food on the table. They might be struggling to do that AND do/get the things they want, but the average American is still wealthier than the rest of the world by a long shot. I absolutely LOVED this blog post and can relate to it SO WELL! I’ve been a working mother, juggling family, full-time work and part-time study, now I’m a SAHM and loving it. But it is SO HARD to enjoy cooking and cleaning and raising children sometimes. So encouraging to know I’m not the only one! Pinned this to my Good Words board on Pinterest, for easy reference in the future… thanks for the great word! Equally beneficial to the family???? What the heck kind of statement is that? I support all WORKING WOMEN. They help to pay taxes to have a safe and caring community and contribute in a positive way to their family. Two consecutive words in ALL CAPS. About a nine on the tension scale, Darlene. LOL. I hope you’ve simmered down since posting that last week. Seriously, you used a lot of tools that make you look angry. If you’re going to get bent out of shape over someone else expressing a different perspective from yours, then I doubt that helps “contribute in a positive way to [your] family” when you walk away from the screen and face them, with your agitation over words on the internet still probably fresh in your mind. When (if) you grow up more, perhaps you will be able to handle opposing viewpoints without displaying some pretty impressive dramatics like those you exhibited above. You’ve certainly made a point, but it might not be the one you intended. I can realate to this, from before the times of internet usage. As a single woman and then in marriage -before-children time, I really enjoyed sewing, cross-stitching etc. When our first 3 children were very young, I found that I really began resenting them at times because I didn’t have time to do those hobbies I did before, or, as soon as I’d sit down to do some needlework, the children being occupied with something else, they would want my attention. I came to realise that it was harmful for our relationships and had to make a conscious decision to put my projects aside for later when the children were older. Seven children & about 15 years later I began to be able to pull out my 2 major long-term projects, one a tapestry, now hangs on our loungeroom wall. The other an intricate cross-stitch, is still a work in progress that I enjoy doing some Sunday afternoons. We have to be aware that even ‘good’ things can, but shouldn’t be allowed to, get in the way of nurturing our precious children.